PLAYER OF YEAR -- Wayne Madsen. Wayne Madsen was the big winner at Derbyshire CCC’s gala dinner and awards ceremony on Saturday night, picking up two accolades, including the coveted player of the year prize. The 32-year-old enjoyed a standout season in all formats, topping the club’s first-class run-scoring charts with a career-best tally of 1,292 runs. 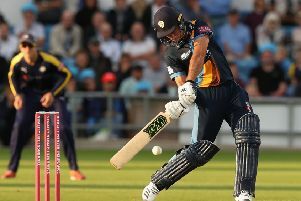 He was also the first batsman in Division Two of the Specsavers County Championship to reach 1,000 runs -- a landmark he passed for the fourth consecutive season. Madsen’s exploits in red-ball cricket won him the club’s Championship player of the year award, as well as the main honour. Shiv Thakor pocketed two awards too for most improved player and NatWest T20 Blast player of the year after an impressive season in which he averaged more than 67 with the bat in Championship cricket and take 43 wickets in all formats. The Royal London One-Day Cup player of the year accolade went to Ben Slater after he averaged 82 and hit two centuries, including a record-breaking top score of 148no. The full list of winners is: Cricket Derbyshire Academy (in partnership with the University of Derby) Recognition Award, Callum Brodrick; Chris Warne Shield for Academy Performance, George Sellers (61 and 103no versus Yorkshire); Second Team Player of the Year (sponsored by chairman Chris Grant), Tom Wood; Most Improved Player (sponsored by the ‘Derby Telegraph’), Shiv Thakor; Eddie Barlow Inspirational Performance Award (sponsored by David Griffin), Harvey Hosein (108 and 59 versus Worcestershire). Clubman of the Year (in memory of Trevor Bowring), James Pipe; NatWest T20 Blast Player of the Year (sponsored by 3aaa), Shiv Thakor; Royal London One-Day Cup Player of the Year (sponsored by Showcase Cinema de Lux), Ben Slater; Specsavers County Championship Player of the Year (sponsored by the University of Derby),Wayne Madsen; Spirit of Cricket Derbyshire Award (sponsored by Briggs of Burton), Tom Poynton; Player of the Year (sponsored by chairman Chris Grant), Wayne Madsen.